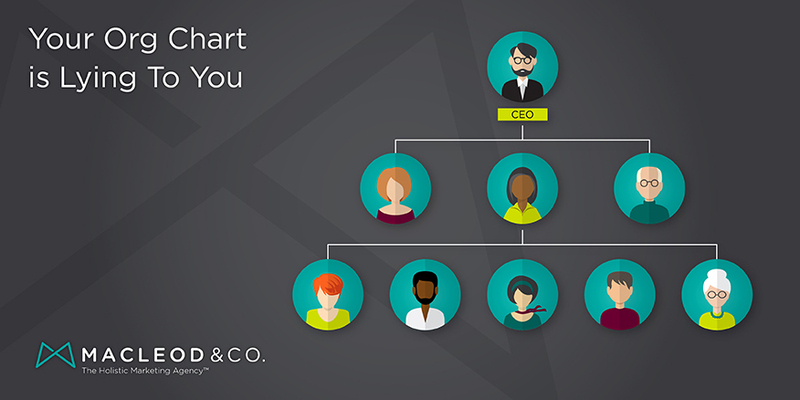 Your Org Chart is Lying To You – Macleod & Co.
We would all love to believe our Org Chart is a blueprint for how power flows through our businesses. But let’s be honest: your org chart is really just a flowchart of who does whose review. We respond to our environments based on our personal experiences, fears, and desires. We have our own agendas and motivations and, consciously or not, we make choices based on our values. Sue in sales doesn’t trust Jack in marketing, so the connection between those two departments is broken — and efforts to improve either function will be considerably challenged. Jack’s got a great relationship with Cassie in HR, though, so Jack gets first pick of recruiting resources, and Cassie overlooks little things about how Jack runs his department. Tom at reception yields an incredible amount of power because he’s infecting everyone who calls with his unacknowledged frustration, thus setting the tone for inbound sales calls. The situation is doubly dangerous because it isn’t a problem you can throw money at, and it’s easy to ignore. You view these facts as two huge reasons not to tackle it. Net-net: the business suffers. The sooner you understand how things work, the sooner you can harness what is good, and root out what isn’t working. The truth is the first step in setting your company free. Active listening by a third party will yield tremendous insights. Exercises we’ve done with organizations generally undertake to listen to 6% – 100% of staff from all levels, depending on the size. We start with a list of questions and once the employees understand what’s going on, they never fail to open up. Everyone wants to talk, and everyone wants to know they’re being heard. We use a tool called TrueChart ™, which is an org chart that shows how things really operate. You might see that Tom at reception does have a lot of influence in the organization. You might also find out that Tom has some great ideas that could not only help the company in the short term, but might yield some positive long-term strategies as well. Conversely, you may find that Tom just isn’t a great fit for his role. Now’s the time for triage — what areas require immediate attention? Where are your quick-wins? Another tool we use is called TouchPoint HeatMap ™ — it gives a clear, visual representation of positive and negative interactions, as well as customer touch points. It’s eye-opening, it’s actionable, and it gets things moving in the right direction. These three activities are the foundation of a Holistic Marketing program. A clear articulation of organizational goals coupled with a clear articulation of organizational truth means the optimization process can begin.